I don’t want to sound overly cynical or critical, but some experiences (more than one would have thought possible) over time have forced me think about getting (and giving) some lessons in the fine art of rudeness. There is an adage – ‘do in Rome as the Romans would do’, so it would make sense to learn the ‘art’ of rudeness to fit into the world today. If you don’t agree, then stop reading! (Here is your first lesson – see how easy it has become to be rude!). People seem to perfecting this ‘art’ by using it whenever they can, and even creating opportunities to sound as brash and curt as is possible. After all – practice makes one perfect, right! Always, always interrupt when someone else is speaking. Tell them you don’t mean to, but always intrude and cut in on someone when they are trying to get a word in. You need to be heard – doesn’t matter what anyone else has to say. Okay – if you are unable to master the interrupting bit, then you can most certainly speak in a decibel way louder than the person who is talking. Some people have mastered this art – sometimes being so loud that their voice continues to ring in the hearer’s ears for a very long time post the ‘conversation’. Patronize – be as arrogant and supercilious as is possible. This goes extremely well with interrupting and talking over. After all, you do know every topic and subject better than the person talking or anyone else for that matter. Make the other person / persons feel stupid and idiotic, by continually telling them that they did not comprehend what your smart self was trying to convey. Tell them constantly that they have misunderstood and misinterpreted everything you said – for example, label a person with the ‘choicest adjectives’ and then say, “that’s not what I meant. Is that what you got from what I said”? Ensure they feel that they can never understand anything correct. Ensure that punctuality is not part of your life. Arrive late – for everything, especially for meetings that involve the time and effort of others. 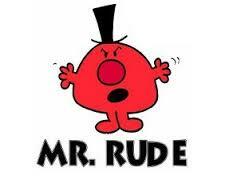 When you do arrive, follow rules 1-4 – if you are doing something do it well – perfect the art of rudeness. Remember also that apologizing for your lateness or anything else is not for you. Never say sorry for anything. Never. Always be as vague and non-committal as possible. The acronym ASAP for example is one of the finest examples of ambiguity – use it often. Miss deadlines and never apologize (part of rule 6), never answer or return calls, if you answer a call, do not let the caller speak but cut in and say that you are busy and will call back. Of course, you should never call back even if you said so. Always appear busy – so responding to messages, emails, and other forms of communication would not be expected of you. After all, it is not your job to be courteous and thoughtful, that’s for everybody else. Try as you may, there would be topics being discussed that do not catch your fancy, ones that you consider boring or irrelevant to you. Don’t stand for it – start speaking about something that does interest you, even if it is completely irrelevant to the topic of discussion. If you don’t have a topic, just stroll out of the room while a person is talking, or use your phone to send messages, check your emails, or better still to play a game. Remember to keep your mobile phone on ringer mode – silence is not for you. You don’t need to respect the others or listen to their opinion. Lastly, and most importantly, if you are ever at the receiving end of 1-8, stand up and proclaim that it is RUDE. We are all guilty of at least one of these rules and the perfecting the art seems to continue unabated. What do you think? Am I right, or am I right? This article is not meant as an instruction or lecture, rather it is my endeavour to share my life’s experiences and how giving back has helped. Life for everyone is tough – yet it is human nature to consider one’s own life tougher than anyone else. The reality however is that there are people ‘out there’ facing far greater trials and tribulations and lead a much harder life than you do. People face challenges daily – in some of the most basic areas of life – not making enough money to meet expenses, not having enough to eat or having a place to live and not having access to education. Giving back is about easing someone’s problems – not by offering some cheap product or helping them in exchange for something. Giving back is meant to be selfless – it is giving without expectation of any benefits, reward, recognition or any other such tangible something. Giving back is being happy in the knowledge that you have done something for someone in need – touched their life and made a significant impact for then. Your action has made them more positive and spread some happiness in their life. There is really no way to describe the feeling you experience when you give back. For us it may be a small insignificant act of kindness and thoughtfulness but for the receiver it would make a world of difference. Don’t shy away from doing even the smallest act of goodness and kindness – it always brings about a transformation. Giving back in the form of volunteering for example – brings about a sense of belonging, enables the sharing of ideas and thoughts amongst people from different communities and backgrounds and enriches one’s life due to the lack of expecting anything in return. It is a feeling of gratification and self-development. I have done some volunteering work too – which began with the thought that I would help others. Initially, it helped me gain vital experience, meet like-minded and sometimes influential people and gained for me new insights and skills. However, with time that inexplicable glow I would feel on the inside when I helped someone and received a wide eyed expression or a 500 watt smile in return, made me realize the actual importance of giving back. It built character and thankfulness for my own life and the people I cared about. Giving back without expectation gave me a sense of purpose, optimism and a feeling of being useful in more ways than one. I was able to keep many negative thoughts and depressive behaviour at bay – I stopped fixating on problems that I seemingly had and instead felt a sense of accomplishment and satisfaction. Each time I am able to make a positive difference, I feel uplifted and empowered and it fills me with more confidence to face the challenges and problems of life. It leaves me with a feeling of well-being, of knowing that I can take on more. I also feel more alive and my physical and psychological states are boosted with vibrancy and energy. Giving back returns to you much more than you give – it gives life meaning and you feel fired from within and you are filled with an overpowering sense of freedom, joy and usefulness. This feeling is irreplaceable, priceless and is not one that money or business success can get for you. The phrase time is money is held with deep regard by business owners and other successful people. They guard their space and time zealously and refuse to let anyone step in unless they want. Of course, the reality is that one person or a few persons cannot completely manage the entire operations of a business and it becomes essential to hire people who would do that for you. Every business has its share of roadblocks, distractions and upheavals but it those businesses and people who can manage these, who are successful. One of the main causes of being able to deal with these diversions is their ability to say no. The quote by Anne Lamott thingsicantsay.com – “No” is a complete sentence. It does not require justification or explanation” – amply sums up why saying no is a perfectly acceptable standard and norm. I have met a number of people who actually feel debilitated because they are unable to say no. These people are highly stressed, frustrated, have trouble maintaining relationships and often face failure because of their fear of saying no. While they realize that this inability robs them of priceless time to do value-added activities, they are powerless. The fact is that most people seem rushed and frenzied because they probably do a number of activities in the day that they could just have easily said no to. So why are people so afraid of saying no? Why are they unable to resolve to grow and develop this capability? It would seem first and foremost is the lack of faith on the capabilities and intentions of those around them. It is a mental block of sorts, which disallows a person to entrust or delegate tasks that they have been doing themselves. They believe that managing everything on their own is the best way. Such people must develop the capability of saying to no to the desire to do every task on their own. No one lives in a vacuum or silo and hence cultivating the habit of inter-dependence is the most crucial first step towards success. Each single day brings with it challenges, diversions and other tasks that we may not be prepared for. While this is the reality, it is not necessary to respond to each such distraction – developing the ability to say no to such demands will leave one a lot more peaceful, happier and with more time to do things they want. The inability to say no is an offshoot of fear and feeling guilty that one might hurt another’s feelings – especially of those who are dear to us. Cultivating the habit of being honest and polite helps – saying no does need to be aggressive. Instead, it is best that the truth be told as to the reason for saying no – if you are unable to comply with a request – be upfront and let the person know. People who care about you will understand your need to attend to priorities and other important tasks – those who don’t – well, you are better off without them. 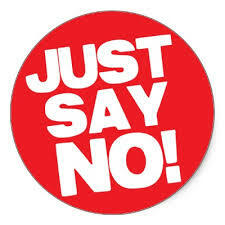 Saying no may seem hard – but it is absolutely essential that it is developed and used appropriately. It is a skill, that thankfully can be learned and over time it can be mastered leading to less stress, more time and better management of relationships. Would you say that as a person you are true to yourself and to others? This translates to – are you someone who believes in commitment and also upholds the view that the very act of being committed means that you are into something for good. 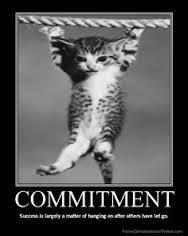 Commitment could be towards anything or anyone and requires a person to believe in this thing or person from the core of their being. Being committed, I know, is like an anchor – it keeps you grounded and opens up your mind and heart to have the capacity to listen, be there for others and yourself and also to be completely present – not just in words but through your actions and thoughts. Just reading what commitment can do for you, is consoling and comforting – right! In my view, true commitment begins with oneself. It is crucial to develop a deep and unflinching relationship with oneself – remain committed to being happy for instance – before you can reach out to others. When you are committed to yourself, it will show in your relationships with others. You will be more aware of how another person feels and what you should do in order to develop, build and sustain meaningful and committed relationships with them. Being committed to oneself means being aware of your own strengths, weaknesses, likes and dislikes. It is also an awareness of anything that contributes toward making you who you are. Such awareness will be the first step towards understanding and being committed to those we care about and to people in general. The world has changed and as resources shrink and people increase, the whole attitude of people seems to have undergone a sea change too. Everyone is focused and committed to only their needs and those of their loved ones. This is not a right or wrong situation – it just is so, but it must be remembered that hurting someone in the race to move ahead, will always be wrong. This could be just my opinion of course! – Commitment can be built by secretly inquiring to oneself whether your friends and family are truly happy. How do you think they feel emotionally, mentally and spiritually, and are there any ways you can help to make them feel better? Such thoughts will only arise and you will find solutions only when you are committed to their well-being. Pay attention to them, to your thoughts and with time you will find that you do have the power to change things – this is commitment at its best. – When you are committed, you will find time to do things that you truly care about and do things for those you care about. Watch cartoons, sing even if out of tune, cook something special, ‘talk’ to your pet and other such things calm your mind and you will find yourself being more committed and relaxed while facing the daily challenges and vital chores of life. Do something for your mind and soul and when you make them truly happy, you will be led towards being committed and then nothing will seem like a chore. These are just my experiences and thoughts – open your mind and hearts to understand what you feel truly committed to and go ahead and express yourself without restraint and in the most authentic manner possible. If you look around, it would seem like people are always in a hurry – always scurrying around trying to get things done. The real issue is that they are stressed because of being ‘behind time’. Being punctual takes away this unnecessary pressure and allows one to be a lot more in control, relaxed and at peace. There are too many commitments and pressures of daily life as it is – why add to these by being late? Would it not be better to plan your time and tasks better such that you are always punctual. As the quote above suggests – punctuality equals success in personal and professional endeavors. 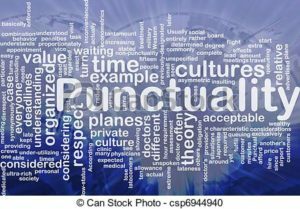 Being punctual is about having integrity and lets others know this about you too. If you make a promise for example of meeting someone at a particular time, it becomes your duty to be there at the time. In an unfortunate crisis that would stop you from being punctual, it is one’s responsibility to keep the other informed of the reasons for delay. Being punctual reveals that you are someone who keeps their word and therefore can be trusted. 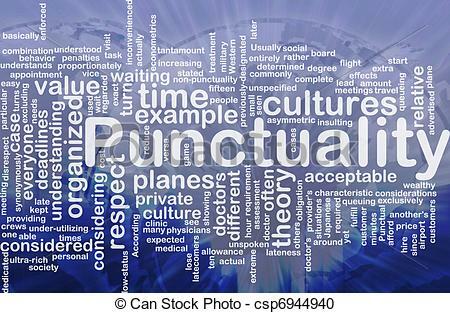 While being punctual is associated with ‘being somewhere at a certain time’, it also encompasses delivering on promises. If you say that you will do something at a given time and date, you must ensure that you deliver on that promise. This leads people to see you as reliable and someone they can lean on when they require. Being punctual translates to dependability and trustworthiness. As your reputation of being a dependable and trustworthy person enhances, you also feel more confident, your morale is boosted and your self-esteem gets a push upwards. Being confident of oneself and makes one stronger and teaches one to depend on oneself and also to break away from habits and behaviors that pull you down. You feel more in control and are then more likely to be able to help others too. If you are constantly late, you would find yourself trying to ‘beat the clock’ and racing around like crazy. Continually being stressed in this manner cannot be good for one’s health and overall well-being. Instead, developing the habit of being punctual eases the mind and allows you to reach your destination and do your work with utmost attention and high quality. Being punctual allows you to prioritize, put things in order and have enough time to organize your day and thoughts. Such planning leads to discipline and a resolve to remain in control. A disciplined person will always find respect and will not only manage the professional life but also have ample time to spend with those they love and do things that they enjoy. Successful people have become so because they attached great value to time – their own and those of others. They are able to leave a lasting positive impression on people by the way they conduct themselves – sharp, meticulous, respectful, disciplined and other such qualities that each person should aspire to inculcate. The old adage warns – “time and tide wait for no one” – it is important to take this seriously if you wish to progress and remain at the ‘top of your game’.